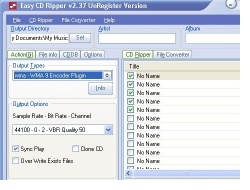 Audio CD Ripper - Rip Audio CD Tracks to MP3, CD to WAV, CD to WMA, CD to OGG, etc. Audio CD Ripper - Rip Audio to MP3, WAV, etc. The audio CD format is typically referred to as a CDA file (.cda). CD audio uses a sample rate of 44.1 kHz and for stereo audio. An audio format is a medium for storing sound and music. It is applied to both the physical recording media and the recording formats of the audio content – in computer science it is often limited to the audio file format, but its wider use usually refers to the physical method used to store the data.Nero CD-ROM inside the production audio is produced in audio cd format. ImTOO CD Ripper is a flexible tool used to extract CD tracks to MP3, WAV, WMA, OGG Vorbis, VQF, APE with ease. Auto-detecting your CD-Rom and auto-listing tracks makes you can rip these tracks by just one click. Support retrieving tracks' information from remote CDDB (CD database) or creating your local CDDB. You can select bitrate from 32Kbps to 320Kbps for MP3 encoder. 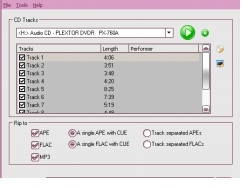 ImTOO CD Ripper allows you to edit ID3 tag and add files to M3U/PLS playlist. Embedded CD player can playback CD tracks before ripping. It also provides volume normalization for tracks different volume levels. Easy CD Ripper is an all-in-one music tool for ripping and converting. As a piece of famous CD Ripper software, it rips audio CD tracks to audio formats MP3, WAV, WMA, VQF, OGG, APE with excellent output quality and high ripping speed. It also supports converting MP3, WAV, WMA, APE, VQF, OGG, AAC, MP4 from one format to another. Clone CD into image file bit by bit perfectly. Power CD to MP3 Maker is a powerful and extremely ease-to-use tool for converting audio CD tracks to audio format MP3, WAV, WMA and OGG. It copies the audio digitally with excellent output quality and high speed. Saga CD Ripper digitally copies audio CD tracks to MP3, WMA, WAV and OGG files with excellent quality and fast speed. Saga CD Ripper offers rich options and you can set the bitrate and frequency for your special requirements. It supports FreeDB function, you can get track title, artist, and album information from the Internet CD database. 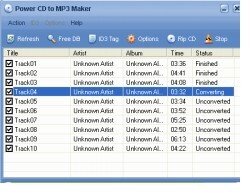 CD to MP3 Maker is an extremely easy to use MP3 to WAV decoder, WAV to MP3 encoder, and CD ripper. It copies the audio digitally-not through the soundcard, which enables you to make perfect copies of the originals. It also helps you to burn your own customized CD from MP3 files.